Kaci Hickox court order: Ebola worker must stay three feet away from others, judge says. 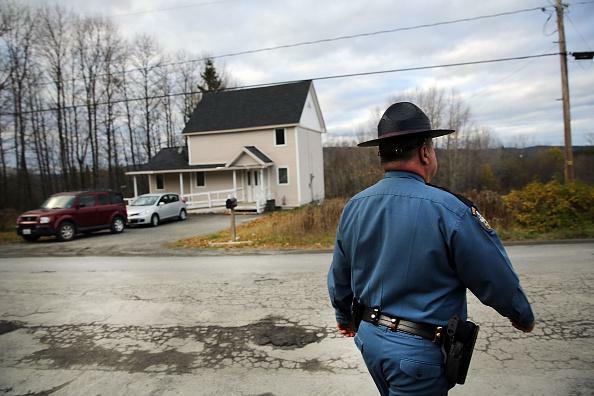 A state police officer in front of Kaci Hickox’s home. The state’s petition, filed Thursday, asks the court to require Hickox to: submit to monitoring, coordinate all her travel with public health officials, not be present in any public places, maintain a 3-foot buffer from others while engaging in outdoor public activities such as jogging or biking and not leave Fort Kent. The individual should be ensured, through public health orders as necessary, to undergo direct active monitoring, have restricted movement within the community, and not travel on any public conveyances. Non-congregate public activities while maintaining a 3-foot distance from others may be permitted. These individuals are subject to controlled movement which will be enforced by federal public health travel restrictions; travel, if allowed, should occur only by noncommercial conveyances, with coordination by origin and destination states to ensure a coordinated hand-off of public health orders, if issued, and uninterrupted direct active monitoring. Hickox reportedly agreed to abide by the ruling until this morning; a “further decision” on her status is expected later today.